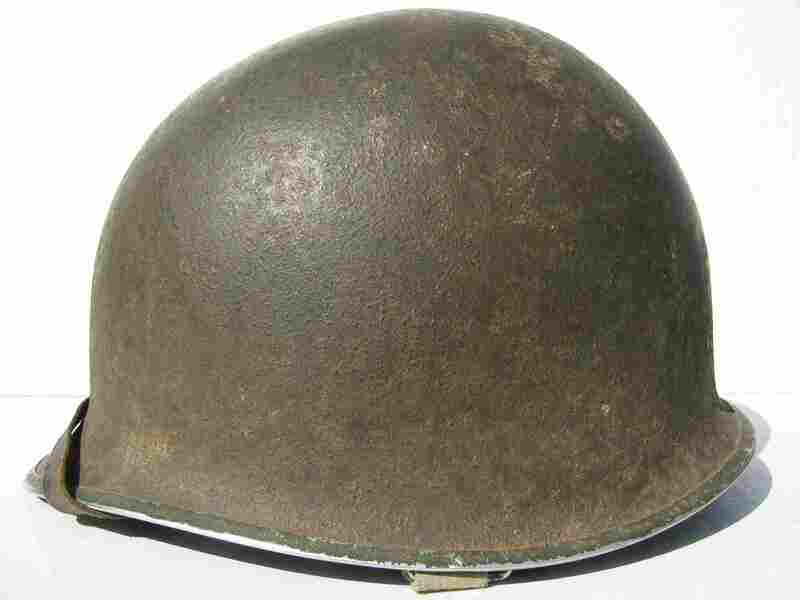 M1 helmet, with 2nd pattern Hawley Liner. The unique camouflage pattern was brushed onto the helmet shell likely by the Marine who wore it. During the Second World War, the Pacific Theater of Operation (PTO) covered a wide swath of the world. From the icy Aleutian islands to the steaming jungles of New Guinea, to the black sands of Iwo Jima. The steel helmets the American fighting men of the Pacific would wear differed little from the one their counterparts were issued in Europe and North Africa. 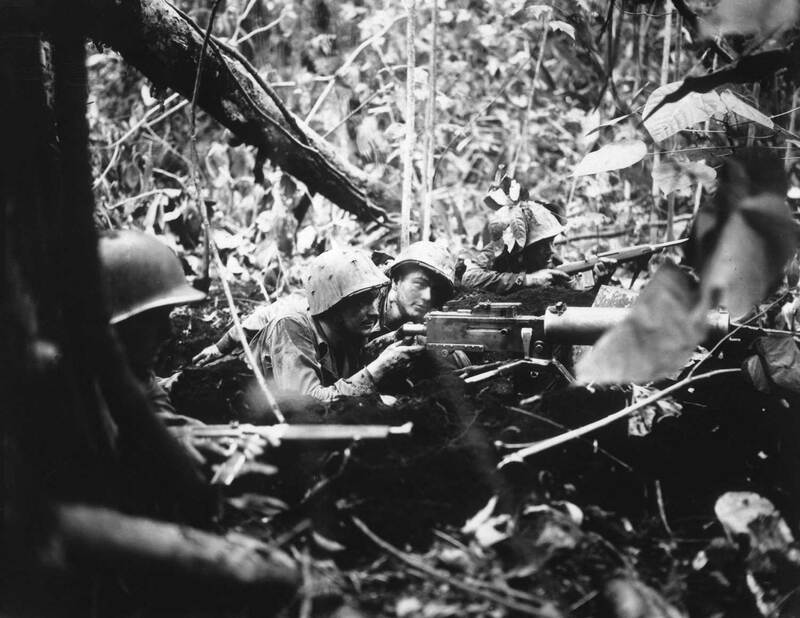 The conditions which American soldiers, Sailors, and Marines would find themselves fighting in would require a variety of helmet covers, netting, and camouflage patterns which would be entirely unique to the PTO. Little to smile about. U.S. 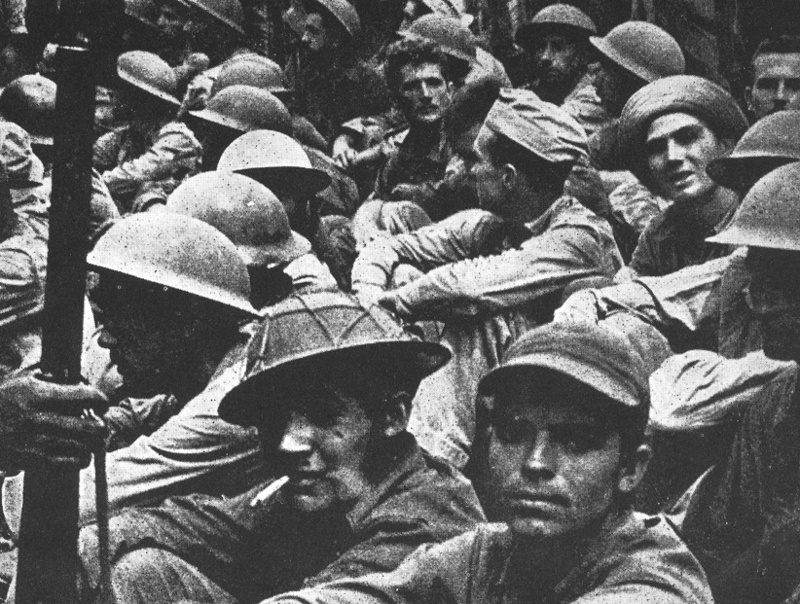 Soldiers recently taken captive by the Japanese at Bataan. Many wear old re-worked WWI P17s helmets. With the Japanese bombing of Pearl Harbor on December 7th 1941 signaling the U.S. entry into WWII, the American servicemen still wore the helmet of their Great War predecessors. 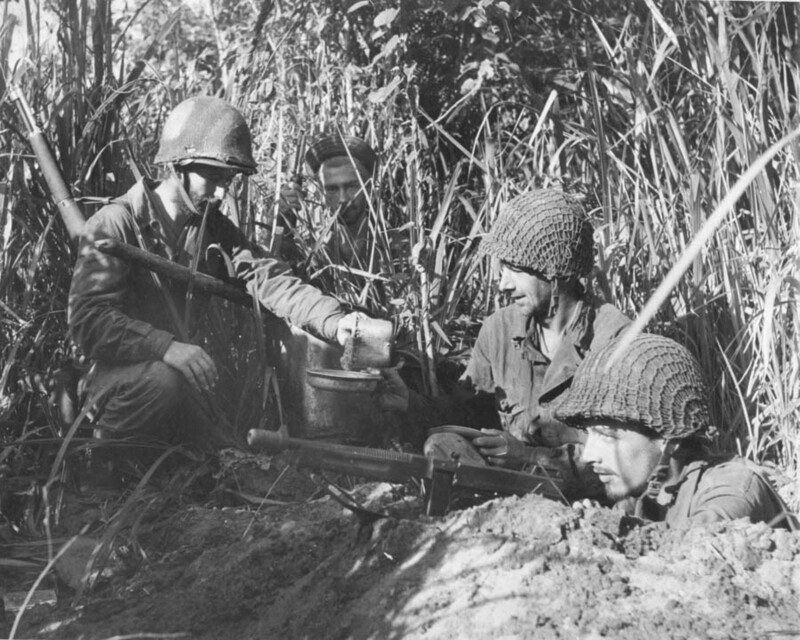 The P17 or so called “soup dish” was still the standard service helmet in 1941. However, in January of 1936 an order was issued to modernized the P17. A new liner and chinstrap was designed to replace the old non adjustable liner. The newly designed liner had adjustable aluminum frame and a web chinstrap which was far more comfortable for the wearer. The re-worked helmet was officially designated the P1917-A1. Liner and chinstrap of a U.S. p17-A1 helmet. The helmets were also repainted with a matte shade of olive drab textured with crushed cork, granulated walnut shells, wood chips or, in some cases, gravel. These re-worked P1917-A1 helmets were typical repainted with a brush often directly over the old WWI paint. It should be noted that not all P17s were upgraded with the new liner and chinstrap system. Photos show soldier still wearing the older pattern well after the 1936 upgrade order was issued. Apparently there were not enough P17 helmets in supply to equip the expanding U.S. military. On November 27th 1940, the U.S. government placed an order with McCord Radiator to produce a small run of these P1917-A1 helmets. Although identical to the Great War era P17, these McCord P1917-A1s can be distinguished by a two-digit heating lot number stamped on the inside of the shell’s skirt and their crushed cork textured matte finish. The P1917-A1 helmet would be the first helmet to see combat with American forces in World War II. 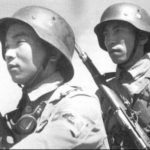 It would be the helmet worn by the China Marines while they stared down the Japanese at Soochow Creek in Shanghai in 1941. It was the helmet of Peal Harbor, Wake Island, Guam, and the Fall of the Philippines. Yet despite this, even before the Japanese bombs began to fall on Peal Harbor, a new helmet was already being designed. The new helmet had been in the works for the U.S. military since 1932. The design process was a slow one and it would not be until June 26th of 1941 that McCord Radiator would finally received a contract to start production on a newly designed helmet. The new helmet was a vast improvement on the P1917-A1. The helmet was officially designated as the M1, but would quickly received the moniker “pot” from the troops due to it’s look and shape. The M1 was a domed shape helmet which offer more head, neck, and ear protection than the old P1917-A1. The helmet had a web chinstrap, similar to the old P1917-A1, bar tacked onto fixed loops or bails which were spot welded onto each side of the helmet. 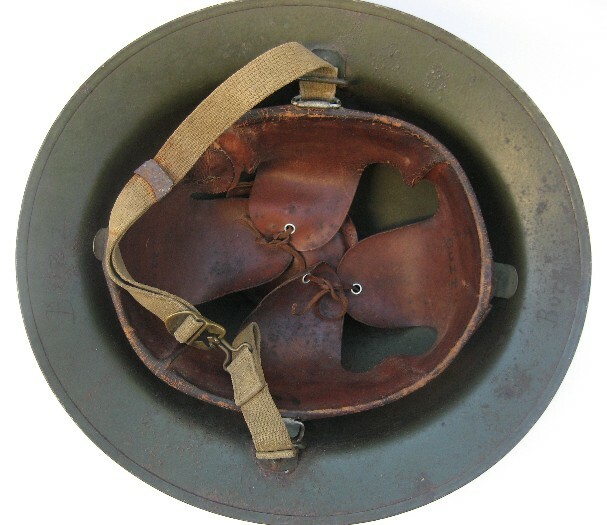 The fixed loops would be modified to swivel in 1943, but these helmets didn’t reach the men in the Pacific in any meaningful quantities until late 1944. 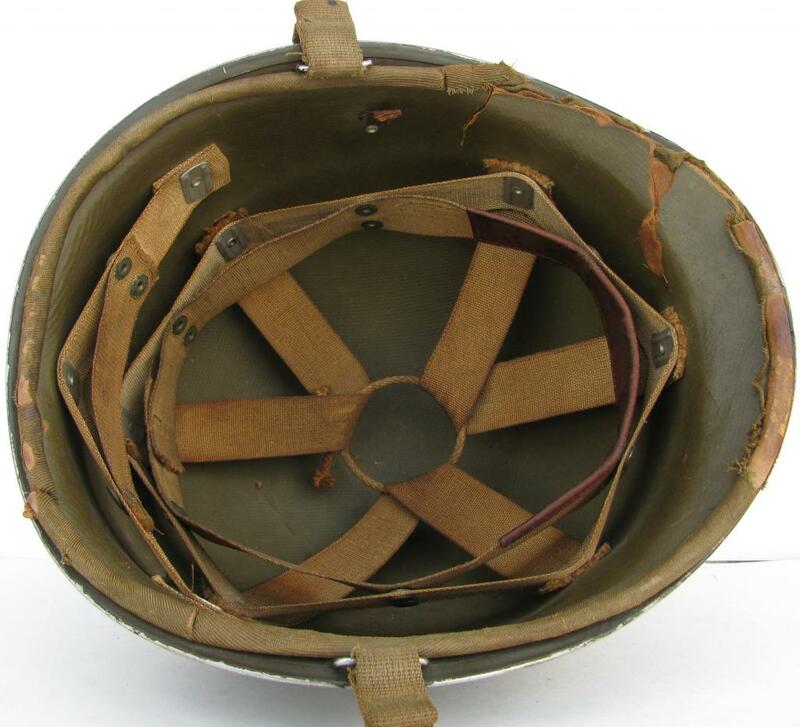 For the vast majority of the Pacific War, the fixed loops version would be the most common helmet. The M1 helmet accommodated a removable liner which allowed the wearer to utilize the helmet as a wash basin or even as a entrenching device should the need arise. Initially the liners were made from olive cloth covered presses fiber with silver rayon suspension of the exact same pattern used in Riddell football helmets of the era. These fiber liners or “Hawley” liners, named for one of the contractors who produced them, faired poorly in combat. The perpetual moisture of the Pacific and regular wear would cause the fiber body of the liner to soften and deteriorate quickly. The Hawley liner were eventually replaced with a stronger composite liner made from plastic or fiberglass. The manufacturing for these newly revised liners began in late February 1942. 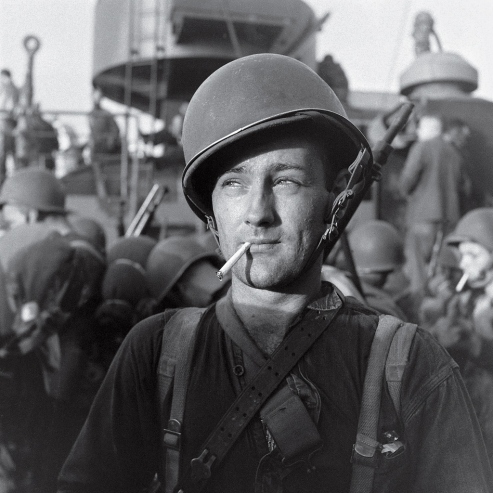 Despite the liner’s short comings, photos show these fiber liners being commonly worn by soldiers and marines in the Pacific into 1944 even after composite liners became available. 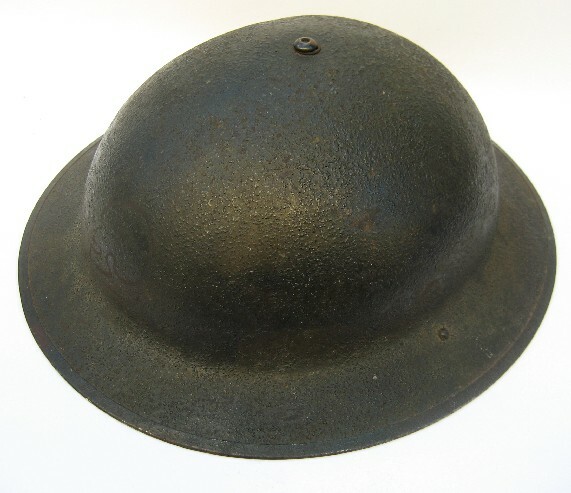 M1 helmet with a 1st pattern Hawley Liner. Note the damage. These liners did not hold up well in the rigors of combat. 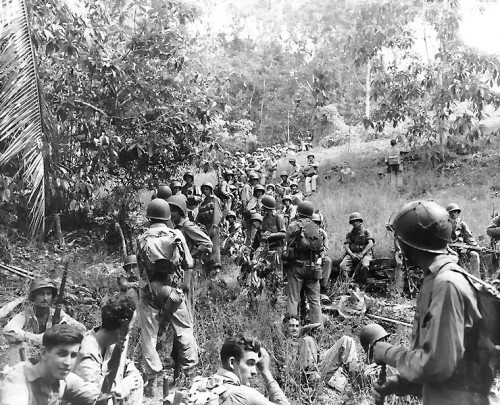 Guadalcanal, 1942. The bill of the Hawley liner is easily recognizable. The M1 helmet would go into full production in late 1941. Due to production issues, McCord only managed to produce 323,510 M1 helmets before the end of 1941. By end of 1942 McCord was able to streamline it’s production line and some 5,000,000 M1 helmets were manufactured. Yet even with these production increases, there would not be enough M1 helmets for the a U.S. military that was expanding exponentially. The decision as to where the new M1 helmets would be allocated would be a result of the Roosevelt administrations, Europe First policy. Despite having been attacked by Japan, the Roosevelt administration decided on a policy which would deal with Nazi Germany first. 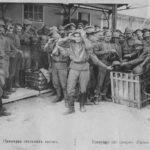 This decision necessitated the allocation of the newest and best equipment, including helmets, to Army and Navy units which would be sent to the European theater of operation. Units scheduled for service in the Pacific would therefore receive the new helmets after the needs of those going to Europe were met. 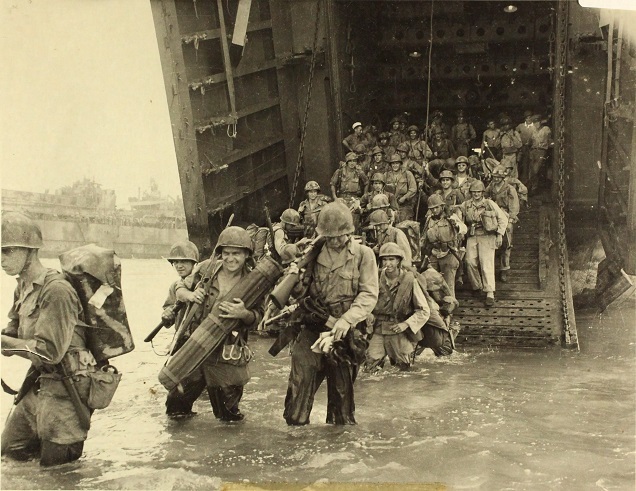 The first American units to deploy to the Pacific were the 41st Infantry Division and the 32nd Infantry division. Both divisions were first sent to Australia in early 1942 then finally to New Guinea. Photos taken of these units in Australia, particularly of the 41st division, show many men still wearing the old P1917-A1 helmets. Between the time in Australia and the final deployment to combat in New Guinea, most of these men did finally receive M1 helmets. The 32nd division were the first to deploy to New Guinea arriving in April of 1942. At this point McCord Radiator started production of the M1 helmets in massive quantities. Only a few photos exist of men in New Guinea wearing the P1917-A1. This would indicate that not enough M1 helmets reached Australia in time before these units left for New Guinea. The same issue seems to have also effected the Marine Corps. Photos of Marine units in Samoa and elsewhere in early 1942 show a mix of both M1s and P1917-A1 helmets. As with the 32d and 41st division, efforts were made by supply to get the Marines M1 helmets before they arrived to fight in the Solomon Islands. 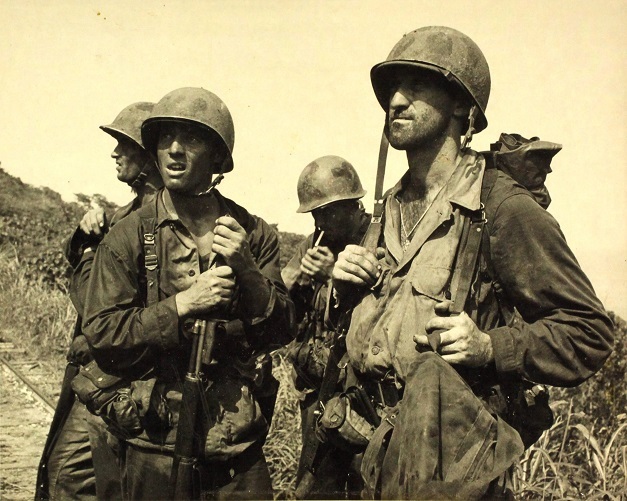 Very few photos exist of men in the Pacific wearing the helmet’s chinstrap buckled around the back of the helmet as was common practice in Europe. The reason for this is early production of the M1 helmets were issued with a short chinstrap of about 8 inches. This strap could not be buckled around the back of the helmet. Helmets produced later in 1942 had a longer chinstrap between 10-11 inches. The extra length allowed the chinstrap to buckle around the back of the shell thus getting it out of the way. 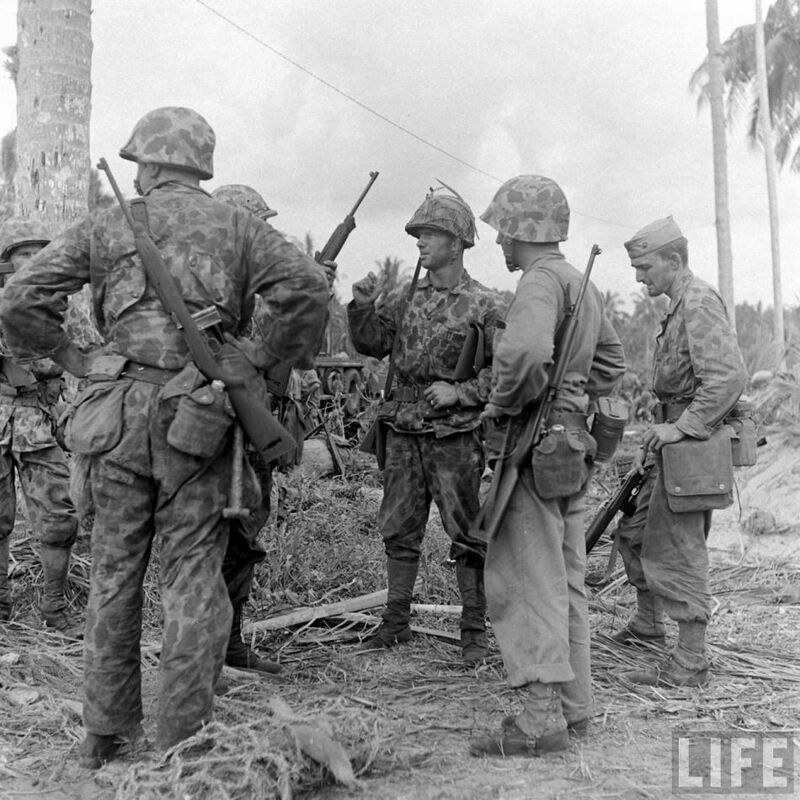 With the time frame of when these units in the Pacific received M1 helmets, indicates that they would have received the early version which had the shorter chinstrap. The only option these men had was to wear the strap as intended or leave it unfastened. It is therefore likely that men from these units developed a culture of wearing the chinstrap buckled under their chins, unlike their counterparts in Europe. When new helmets were received with the longer chinstrap the troops still wore them buckled under their chins as they always had. 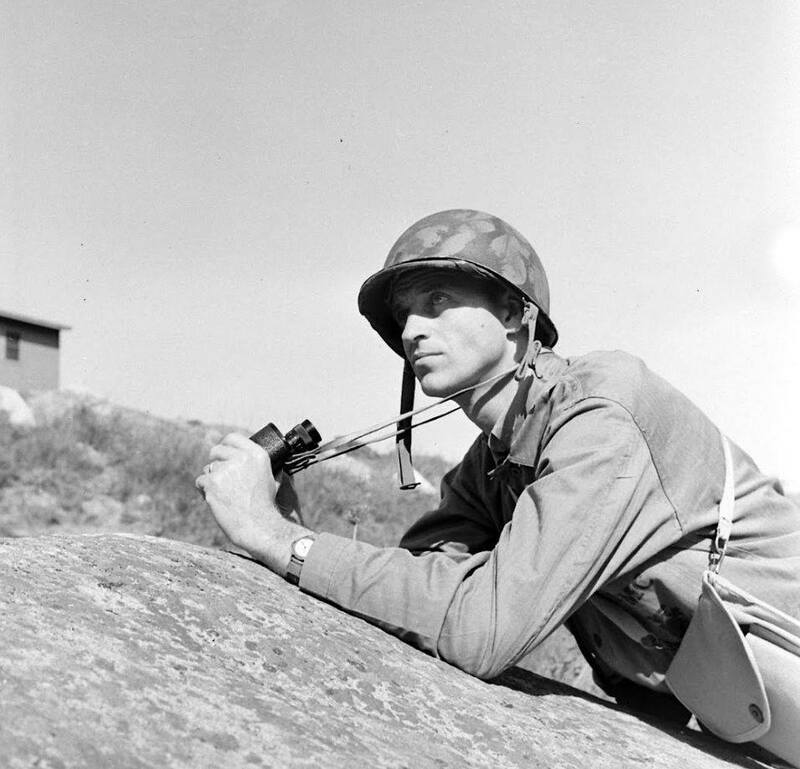 Photo of a Marine during training in Southern California before shipping to the South Pacific. He wears a short chinstrap on his M1. 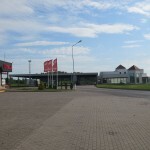 MGen. 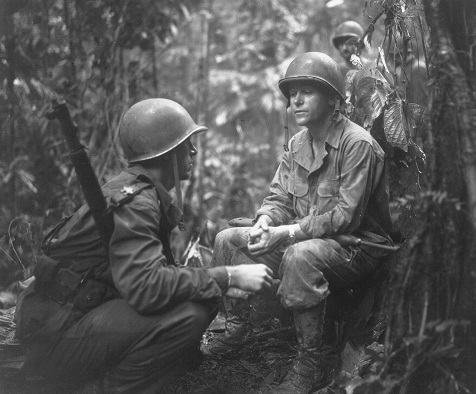 Joseph Lawton Collins (right) confers with Major Charles Davis on New Georgia Island in August of 1943. The refection off the wet surface of the helmets is evident here on both helmets. In theory the finish on the M1 helmet was meant to be anti-reflective, and as long as the helmet stayed dry this was true. 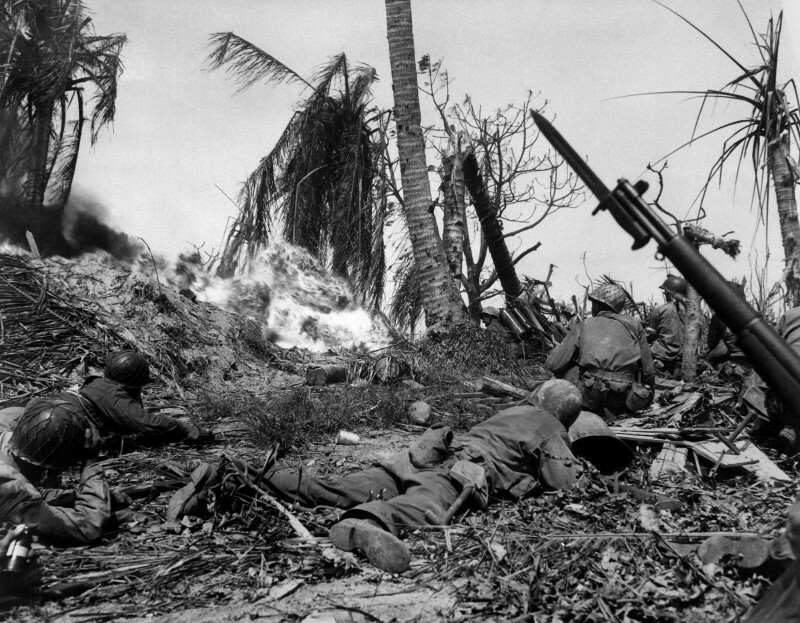 Fighting in the South Pacific meant constant rain and high levels of humidity. These environmental factors kept the helmet’s surface perpetually wet nullifying all the finishes’ anti-reflective qualities. The sun’s glare on the wet helmet’s surface not only made concealment difficult for the wearer but also created a target for the enemy. 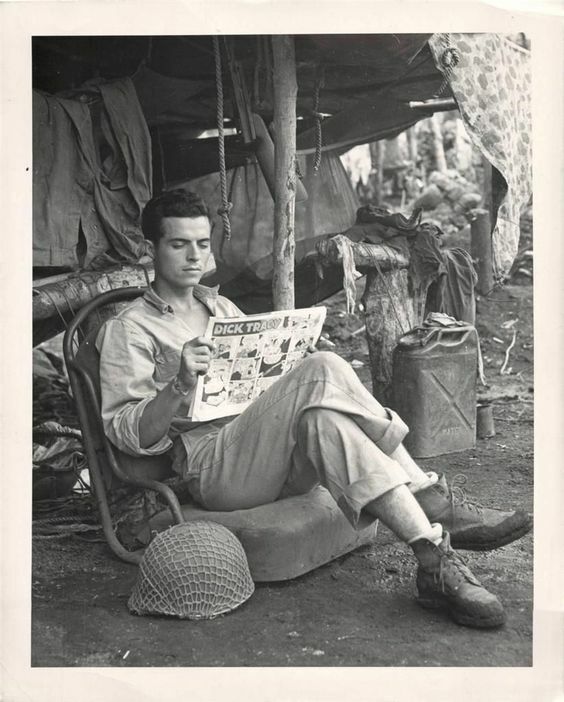 In the early stages of the war in the South Pacific, soldiers and Marines found ways to mitigate this issue. The simplest way was the use of netting. Photos show a wide variety of nets used in the PTO. Some foreign made helmets nets were made available such as Australian and British versions. 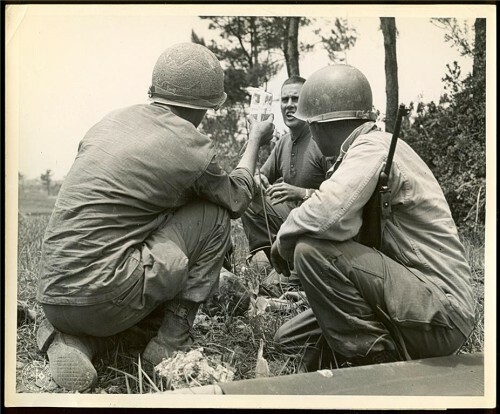 A number of “commando” net with face veils were issued to the 32nd ID and the 503rd Parachute Infantry Battalion. The face veils were rarely used as such and most men tucked them under the liner. Two members of the 32nd wearing helmet nets. These nets maybe the so called “commando” version which had the addition of a face veil. These nets are known to have been worn by both the 32nd ID and the 503rd Parachute Infantry Regiment in New Guinea. Soldiers and Marines also cut down vehicle netting to fashion helmet nets. This method was nothing new as photos show cut up vehicle netting used on helmets as early as the Fall of the Philippines. Some men even made their own net, and in some cases used captured Japanese helmet nets. Even within the same unit a variety of nets were often used. 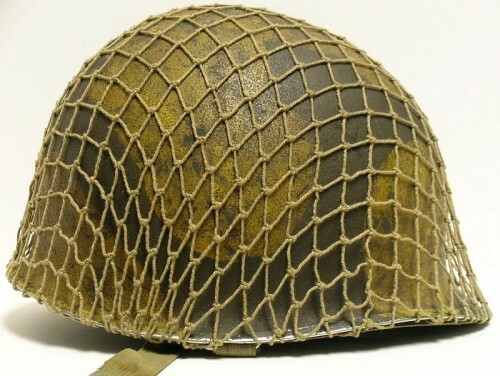 The 7th division would wear a particularly unique helmet net during their sojourn in the Pacific. 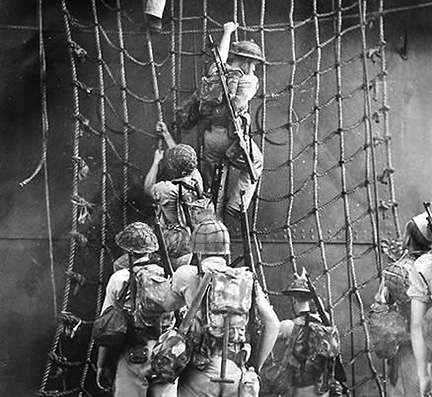 At the battle for Kwajalein in January of 1944, many members of the 7th Infantry Division wore a large mesh net sometimes referred to as a crab net. These unique nets are often mistaken for captured Japanese nets due to the similarity in the mesh. The Japanese net was too small to fit over the M1’s dome and had to be modified to fit. An examination of original photos and surviving original examples show that the crab nets fit the helmet with no modification. These unique nets were locally made in Hawaii before the 7th shipped out to Kwajalein. The U.S. Army would eventually manufacture their own net. The new net was made from dark O.D. #7 cotton material. These nets were issued in the fall of 1944. While photographic evidence shows their use in Europe with frequency in late 1944 and into 1945, they are only rarely encountered in PTO photos. 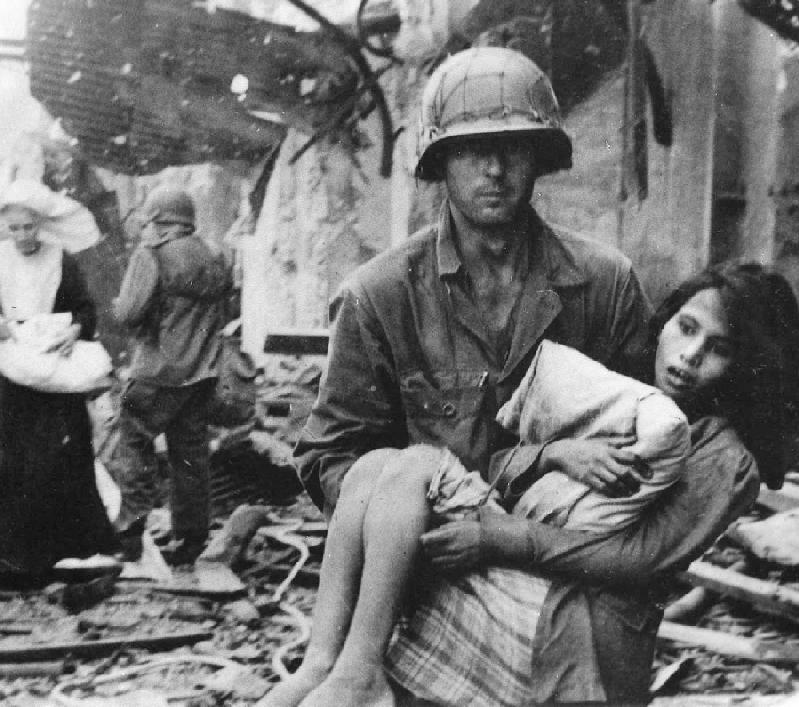 Photo taken in the Philippines in 1945. Even at this late date this man is still wearing a net made cut up vehicle netting. Aside from the use of netting to mitigate the glare from the wet surface of the helmet, cloth covers were also used. The first types of helmet covers to be used in the Pacific were nothing more than burlap cloth formed over the helmet either sandwiched between the liner and helmet shell, or secured with wire, string, or netting. These improvised covers first started appearing during the Tulagi assault in the Solomon Islands but the use spread. Burlap covers were particularly popular with the Marine Raiders in the early stages of the war. Sgt. Walter Carroll and Pfc. Dean Winters of the 2nd Marine Raider Battalion on the submarine USS Nautilus during the Makin Raid. Both men wear burlap helmet covers. Other men fashioned covers from the mosquito netting they were issued. The dull tan color and tight weave of the mosquito net were the perfect properties for blending into the South Pacific terrain. 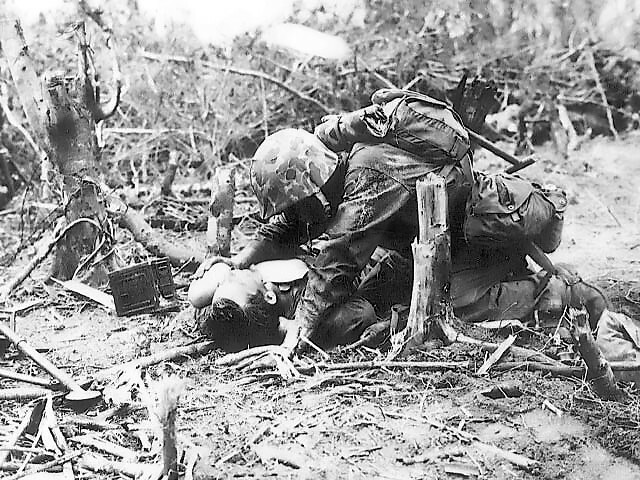 Members of the 32nd ID aid a wounded comrade at Buna New Guinea. The man to the left wears an Australian helmet net, while the man to the right wears an improvised cloth cover, possibly burlap or a mosquito net. While the Army would make do with netting and a few field made covers or nothing at all for their helmets, the Marines would get their own unique cover. 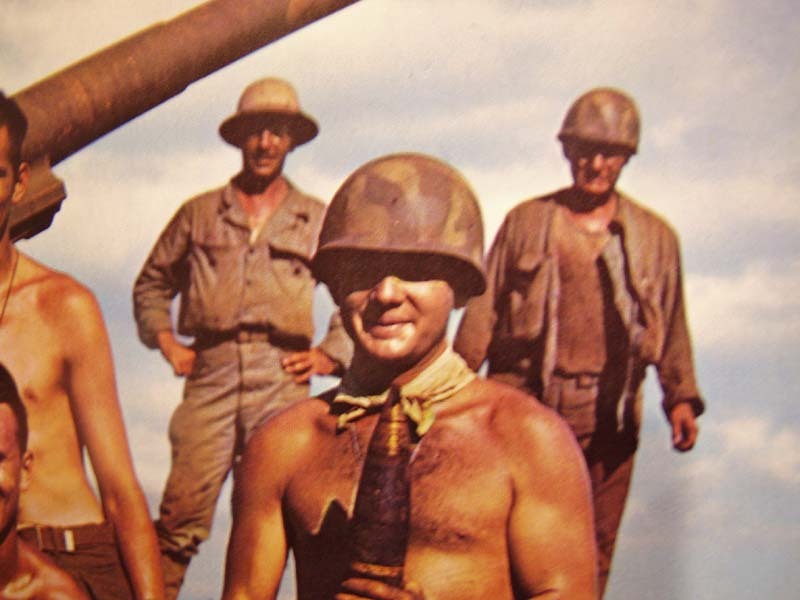 In September of 1942 the Marines Corps adopted a reversible camouflage cover made from cotton Herringbone twill. The cover was reversible with on side consisted of a green jungle and the reverse being brown desert/beach. The cover was designed to fit snugly over the helmet’s dome with flaps which were sandwiched between the liner and helmet. Holes could be slit into both sides of the cover to feed the chinstrap through which allowed the cover to fit more neatly. Photos show many Marines chose to wear their covers more haphazard. This may have been mere indifference on the Marine’s part or possibly to break up the outline of the helmet. Cpl. 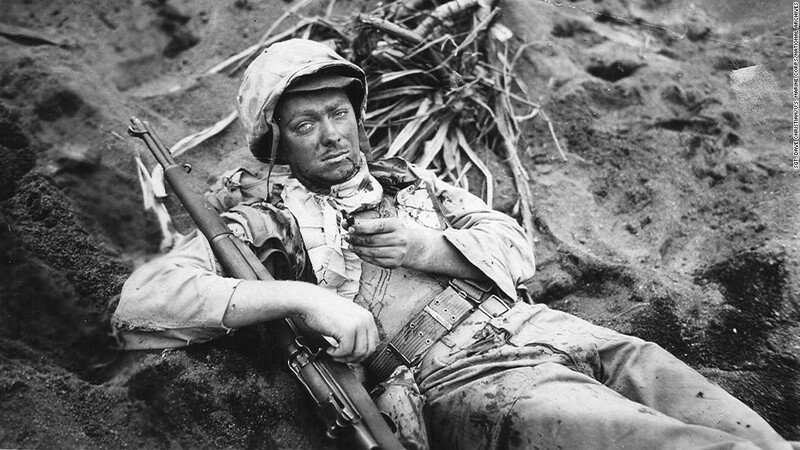 Rudolph E. Engstrom, on Iwo Jima. He is holding the piece of shrapnel that wounded him. Note how poorly the cover is fit onto his helmet. It appears that he never cut slits in the base of the cover to feed the chinstrap through. He may have done this to give the helmet a more irregular shape, to break up the smooth outline of the helmet’s dome. The cover’s flaps could be untucked to protect the wearer’s neck from the sun, “French Foreign Legion style”. 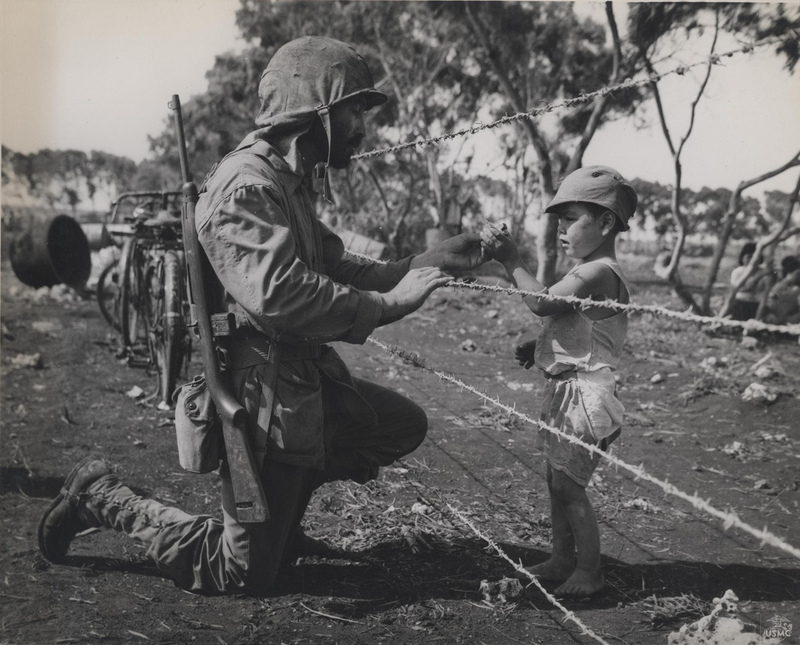 Marine chats with a Japanese civilian boy. He wears the flaps of his helmet cover out protecting his neck from the Pacific sun. There are two patterns of this particular cover. One version made with 16 button holes for the crown of the cover and one button hole on each flap. Another version without button holes. The button holes were intended to hold foliage for extra concealment. Marines fighting at Cape Gloucester. The Marine in the back has stuffed bits of foliage into the button holes of the helmet cover to enhance his concealment. The existence of these two version has been a source of controversy among modern collectors and reenactors. Some have taken to calling the version with the buttonholes as being a “1st pattern” and the version without the buttonholes as being a “2nd pattern”. In truth both of these covers appear to show up at almost the same time in PTO. They can both be observed in photographs taken during the Operation Cartwheel in New Britain in late 1943. Part of the reason for this controversy is the lack of actual period documentation. Some have argued that the buttonhole version was first issued out, but Marines did not use the buttonholes as intended. So a second version was made eliminating the button holes. Original covers were not ink stamped or marked in anyway by the firms who made them for the Marine Corps. Original records have not yet surfaced as to which firms made these covers and how many were made during the war. Any period information as to why two different version of these covers were manufactured is also at this point lost to history. The only information that can be know for sure is that both versions show up in the PTO in 1943 and are worn exclusively by the Marines until the end of WWII. 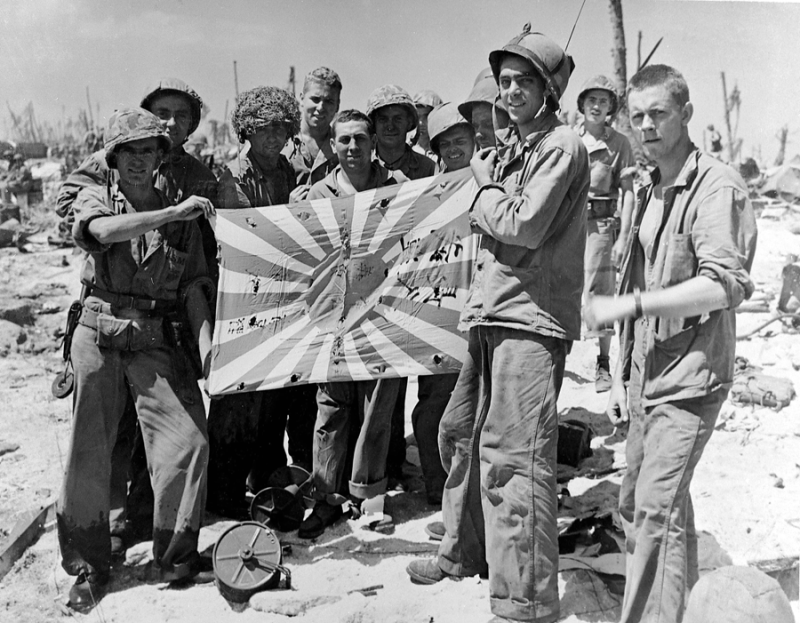 Marines and Coast Guardsmen display a captured Japanese battle flag during battle for Eniwetok Island, Marshall’s, 19 Feb, 1944. 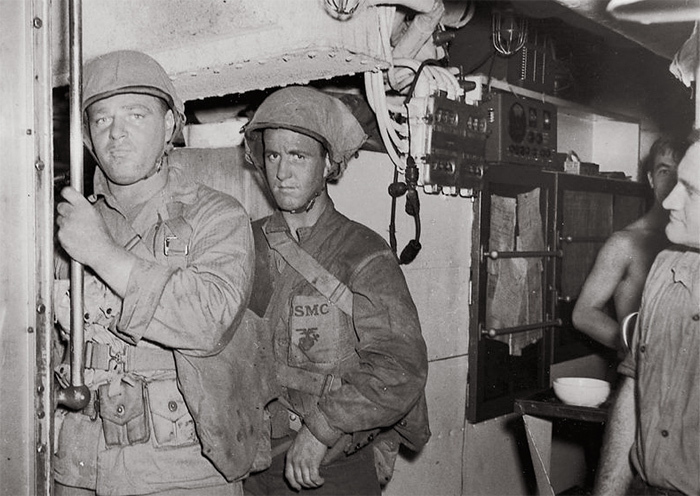 Two of the Marines pictured wear “Mosquito hat net” covers. They have probably cut the nylon netting off. There is a third type of cover that was made exclusively for the Marine, commonly called the “Mosquito Hat Net”. This cover was made from the same material as the other covers, but was not designed to be reversible and only has a jungle green side. The cover was fit with a nylon mesh also printed with the jungle green pattern matching the rest of the cover. The mesh could be pulled down over the Marines face and neck in the event of mosquito swarms as was an obnoxious problem in the PTO. Attached to the bottom of the nylon mesh were laces which the wearer could tie to keep the mesh from riding up. It seems that these covers were rarely worn with the mess because it would have impeded one’s vision. When these covers were worn, in many cases, the nylon netting was cut away. Hollandia, New Guinea, 1944. Two men pictured here wear Jungle liners. One concern the army had about the M1 helmet was that it was discovered that the steel shell make loud noises when it brushed against tree branches. Much of the South Pacific is covered in jungle and this was seen as a problem. The solution to this issue was not to modify the helmet but to eliminate it all together. 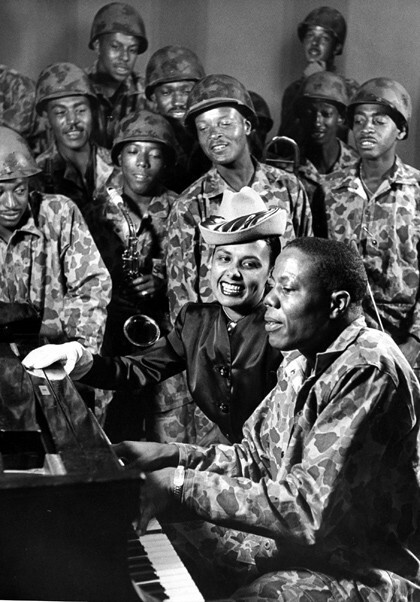 Singer Lena Horne singing next to pianist Silky Hendricks of the 299th Ground Force Band, aka the Jungleers. These men all wear Westinghouse jungle liners. 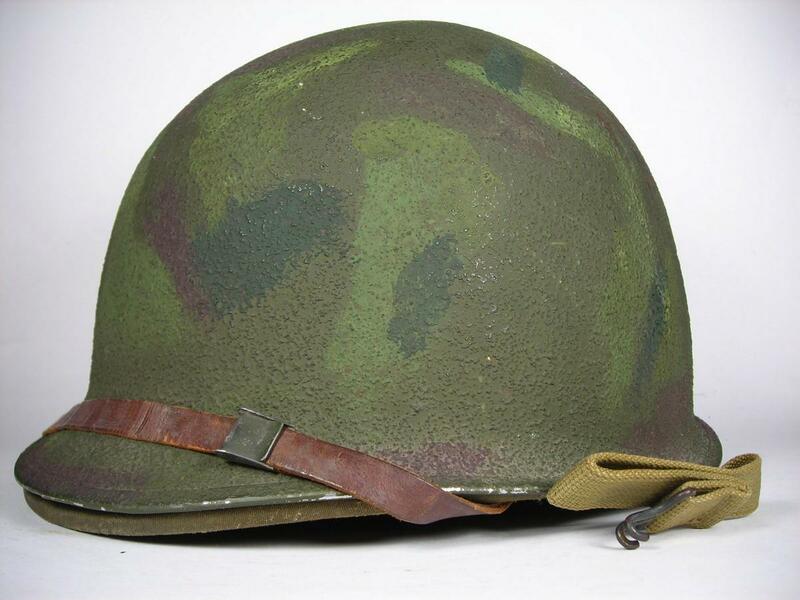 In February of 1942, the U.S. Army ordered Westinghouse to modify the fiberglass helmet liners they were producing to include a three color camouflage pattern. By means of a cardboard stencil, two shade of green and one shade of rust-brown were sprayed onto the liner’s olive drab surface. 1,000,000 of these liner were ordered modified, and some 854,255 were delivered between February 28, 1942 and March 26, 1943. 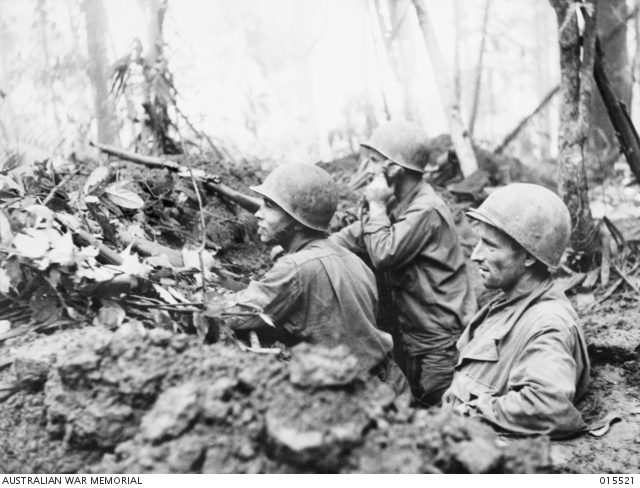 The idea that a fiberglass liner would create sufficient protection to the wearers head was based on the philosophy of how the army believed combat in the Pacific would play out. Jungle troops were expected to travel light, rarely encountered artillery fire due to the jungle environment nullifying it’s deadly effect. Thus a fiberglass liner would offer sufficient protection, and it’s light weight nature would not encumber the wearer. The jungle liner experiment did not last long. 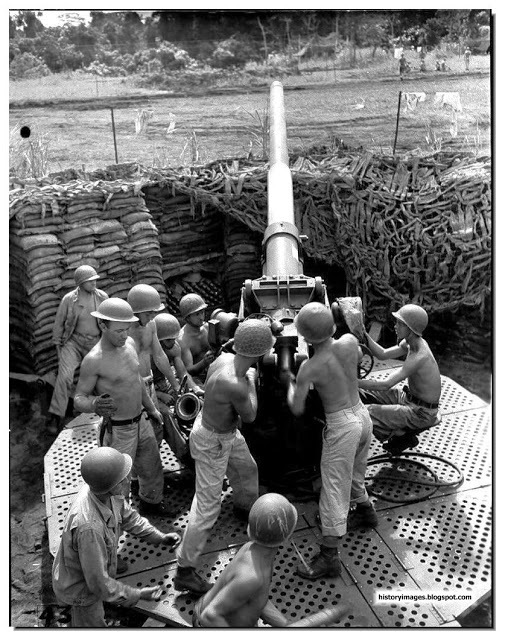 It was quickly learned that artillery would be used in the jungles and it would be just as deadly as anywhere else. A steel helmet, despite its flaws, would be needed for head protection. The final production lot of Jungle Liners was canceled, and the remaining liners were repainted. It was also learned that a helmet net would muffle the sounds made by tree branches. Still these liners were issued out and worn by many army troops in the PTO. 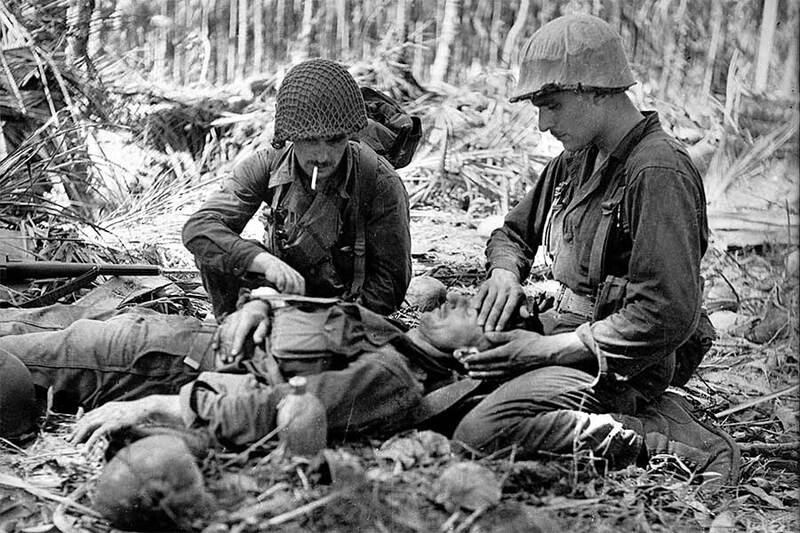 A few photos do exist of men wearing these liners in combat zones without their steel helmet so it does appear that at least a few men tried them out. 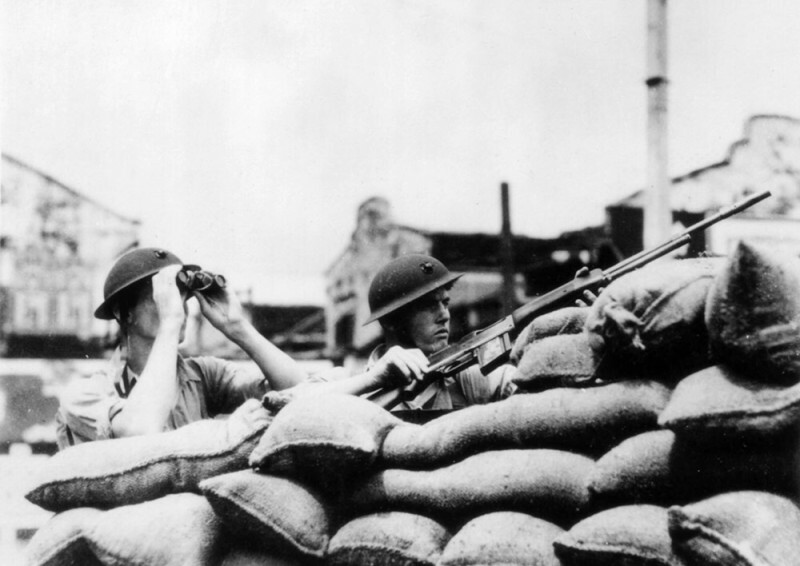 Members of the 105th Infantry regiment, part of the U.S. 27th Infantry Division on Saipan. These men all wear a brushed on camo pattern likely of mustard or light green paint. 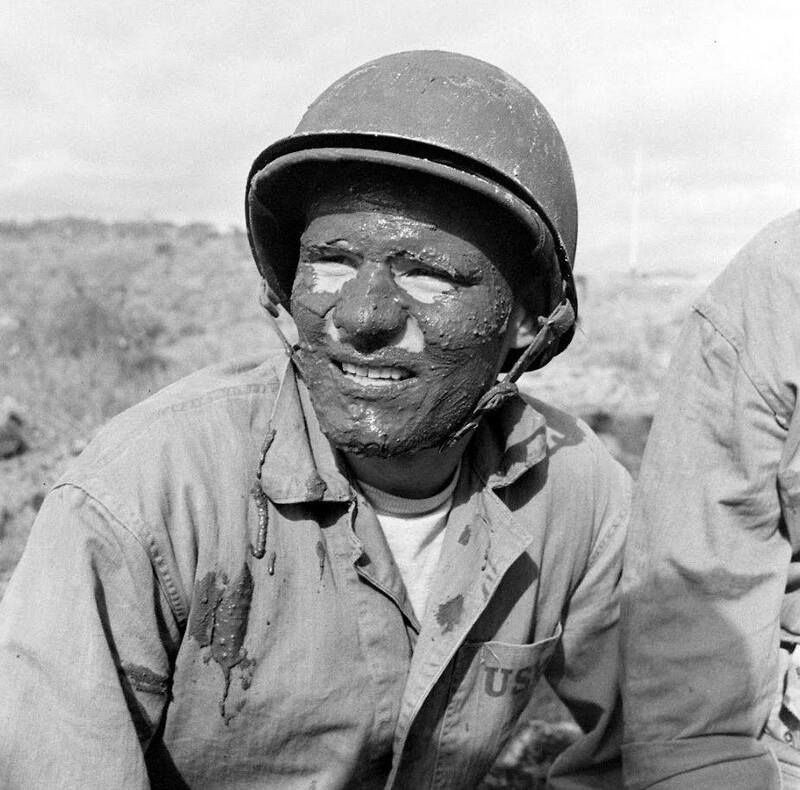 Instead of utilizing a net or cover, some servicemen in the PTO turned to using paint to camouflage their helmets. The use of a painted pattern onto the helmet’s surface would help break up the outline of the dome. It is hard to pin point exactly when this practice started, but a few P1917-A1 helmet have surfaced with unsophisticated camouflage patterns rendered onto their surfaces. This would indicate that at least some men were doing this before the war even started. 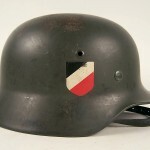 The use of paint to add a camouflage pattern onto the helmet’s surface would continue to increase as the war continued. It first appears on a small numbers of helmets in New Guinea particularly with the 32nd ID and among some of the Marine Raiders in 1943. These camouflage patterns were typically applied by brush using vesicant gas detection paint. The vesicant paint usually came in different shades of mustard or green and was formulated to turn pink or brown when exposed to poison gas. With the devastating gas attack of the Great War still fresh in the minds of military planners, a gas detecting paint which could be applied to military equipment and vehicles seemed prudent. With no gas attack occurring in either theater, the vesicant paint was made available to be used for camouflaging helmets. The use of painted camouflage patterns varied greatly by units. In some case entire divisions would apply a similar scheme while other units would have only a handful of men utilizing this method of camouflage. Two particular patterns appears to be most prevalent in the Pacific. The most common being a curving pattern often called “Micky Mouse” because the curves looked like Walt Disney’s cartoon character Mickey Mouse’s ear. The other was a more geometric zig-zag pattern. Both of these patterns were worn throughout the Pacific and mostly by members of the army. Some units went as far as to adopted their own official pattern. This is particularly true with both the 7th and 27th Infantry division. The 27th Infantry division appear to have universally adopted the “Micky Mouse” patterns as their own. Original examples are mostly painted with mustard or in some cases light green colored vesicant. This was the camouflage pattern worn by the 27th ID during operations in the Marshall islands and Saipan. 27th ID arrives in Saipan. Note that all members wear a Mickey Mouse camouflage pattern. The 7th ID utilized both a unique netting for camouflage, but they also paired the net with a painted camouflage scheme on their helmet. Unlike the 27th ID which mostly stuck with one pattern, various patterns can be observed on helmets worn by members of the 7th including two tones of green and mustard. 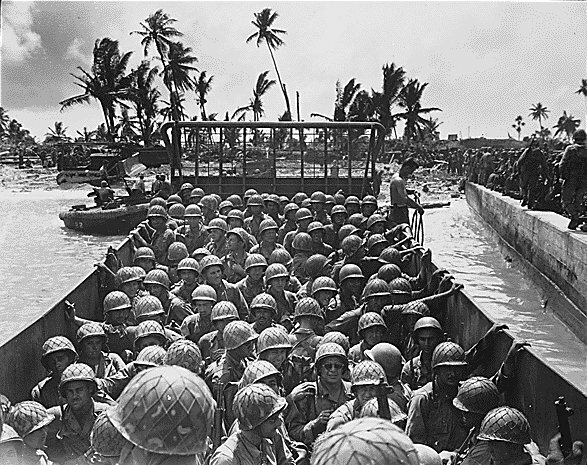 While many men who served in the Pacific wore a M1 helmet without any additional camouflage, most did not. The environment of the Pacific forced many to be creative in finding ways to survive. The use of nets, covers, and camouflage paint were certainly not the only way men found to camouflage their helmets, but it was probably the most common. In the end, a great deal of soldiers and Marines in the Pacific owed their survival to using these tools to break up the outline of their helmets.